The Dixie State football team dropped its home finale to Colorado State-Pueblo on Saturday, falling 31-10 at Legend Solar Stadium on Senior Day. The Thunderwolves stymied the Trailblazers with a stingy defensive effort, holding DSU to a season-low 168 yards (105 rush, 63 pass) of total offense. Running back Sei-J Lauago led the DSU offense with 69 yards rushing on 17 carries. Quarterback Blake Barney finished with 30 yards rushing and a touchdown, while completing 12 of 23 passes for 63 yards with two interceptions. Defensively, the Trailblazers conceded 331 yards of total offense (184 pass, 147 rush), holding the Thunderwolves to nearly 100 yards under their season average. Safety Mike Jones finished with a team-high eight tackles, while Noe Perez, Jordan Nichols, and Trayvon Watson added seven tackles each. Watson also snagged the lone DSU interception of the game. Dixie State falls to 4-6 overall and 4-5 in the Rocky Mountain Athletic Conference. The Trailblazers will close the 2017 season next Saturday at Fort Lewis in Durango, Colo. Kickoff is set for noon Mountain Time. For the complete game story click here. 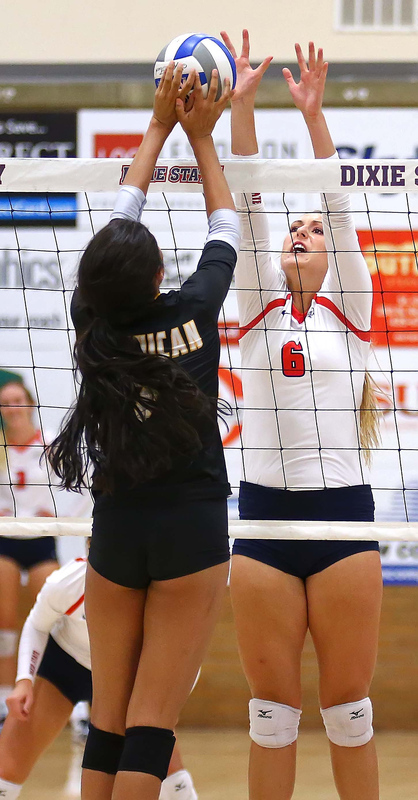 Dixie State opened its final homestand as a member of the Pacific West Conference Monday night with a convincing 3-0 sweep of Hawai’i Hilo inside the DSU Student Activities Center. The Trailblazers quickly bolted out to a commanding two-set lead, taking the first frame by a 25-16 count before blitzing the Vulcans with a 25-9 result in set two. DSU looked as if it had the match in hand up 16-13 in set three, but Hawai’i Hilo mounted a late charge, outscoring the Trailblazers 8-2 to wrestle away the momentum and take a 21-18 advantage. Trailing 23-21 with the Vulcans holding serve, Dixie State managed to avoid going to a fourth set as the Trailblazers scored the final four points to close the match out. Kills by Lauren Gammell and Kaycee Adams, followed by a Vulcan attack error, gave DSU match point, which Kayla Chapman picked up with her team-leading ninth kill of the night. Gammell finished with eight kills, while Hannah Doonan chipped in six and Shannon Sorensen added five off the bench. DSU hit .274 for match with 41 kills to go with seven services aces. Dixie State’s defense also got the job done as the Trailblazers held the Vulcans to a .008 hitting percentage, thanks in part to 14 total blocks, including eight Chapman block assists and six more from Gammell. DSU also finished 67 digs, led by libero Sid Brandon with a game-high 26. The Trailblazers improve to 11-13 overall and 9-7 in the PacWest. Dixie State returns to action this Saturday afternoon when it hosts Azusa Pacific for Senior Day at 12 noon. DSU will then close out its home slate against Academy of Art the following day on Sunday, Nov. 12, also starting at 12 noon. 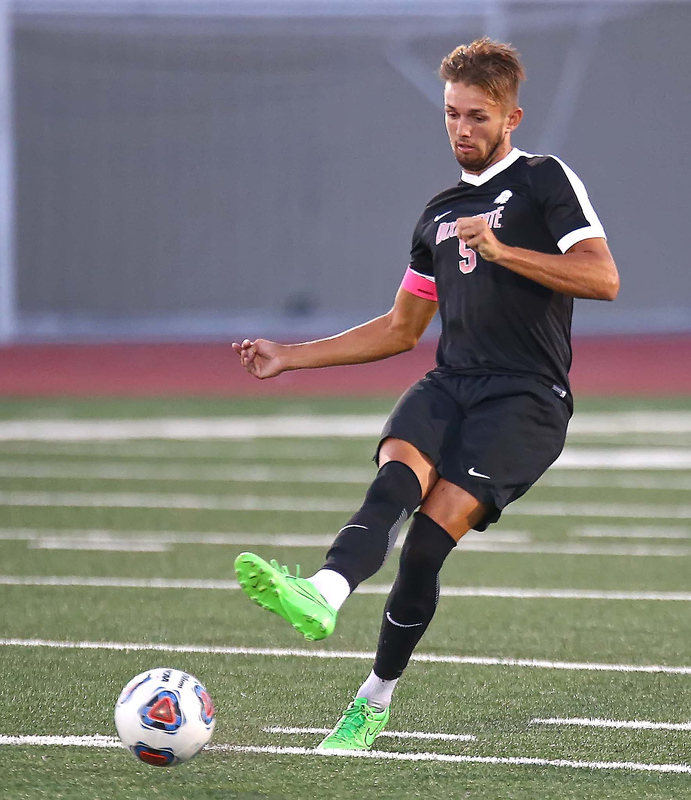 Dixie State tied a season-high with five goals as the Trailblazers rolled to a 5-2 Senior Night result over Azusa Pacific on Saturday night at Legend Solar Stadium. DSU closed the year with a 12-5-0 overall record under first-year head coach Jonny Broadhead, which included a fifth-place finish in its final season of Pacific West Conference play at 8-5-0 (24 points). The two sides traded two quick goals in the opening four minutes of play, with the Cougars opening the scoring on a Lloyd Alexander goal at the 3:37 mark of the match. DSU then got the equalizer just 20 seconds later when Sean Jenne played a middle ball into Dominic Damato, who blasted home his second goal of the year into the right side of the frame. The Trailblazers then took the lead for good with three unanswered goals, the first coming on a Christian Hall header set up by a Moises Medina corner kick with 6:42 to play until the halftime break. With the assist, Medina (14) pulled into a tie atop DSU’s career assist list with Bryan Baugh. DSU would net two goals over the first 21-plus minutes of the second half to extend to a 4-1 advantage. Sophomore Jandir Porta tallied his sixth goal of the year early in the 54th-minute, while Baugh headed home his fourth-career goal in his final match in a DSU kit at the 66:44 mark on a Blake Damato free kick. Alexander got one of the goals back with 13:21 to play to draw the Cougars to within 4-2, but the Trailblazers would answer with a penalty kick goal off the boot of senior Alexiz Beiza to provide the final result. Beiza drew the PK chance on hard foul deep inside the APU penalty box and was rewarded with his first career DSU goal. Dixie State outshot APU by a 16-13 count, including a 7-5 edge on goal. Redshirt freshman keeper AJ Snell collected two first-half saves to earn his first collegiate win in goal. Dixie State garnered several postseason honors. Defender Bryan Baugh, forward Moises Medina and keeper Zach Nielson all garnered first-team selections. For Baugh, it was his fourth straight year receiving all-PacWest honors. Ather Dawood was named to the 3rd Team. Dixie State ended its 2017 season on a sour note as the Trailblazers dropped a 2-1 Senior Night decision to Azusa Pacific on Saturday at Legend Solar Stadium. DSU closed the year with a 12-6-0 overall record, which included a sixth-place finish in its final year of Pacific West Conference play at 8-5-0 (24 points). The Trailblazers took an early 1-0 lead at the 9:53 mark of the first half when freshman Tori Page picked up her eighth goal of the year on a 30-yard blast set up by Kilee Lamb feed. APU netted the equalizer nearly five minutes on a Stephanie Lossau penalty kick following a DSU handball foul inside the Trailblazer penalty area. Lossau would strike again six-plus minutes later when she finished a center ball played in by Katelyn Rogers from 8-yards out to give the Cougars a one-goal advantage. DSU, which was credited with 10 of its 20 shots on goal, had plenty of chances to pull even over the final 69 minutes of play, but could not find the back of the net. Senior Darian Murdock just missed on a pair of shot attempts midway through the first half, while a Jill Bennett header moments before the halftime horn was stopped by Cougar netminder Zoey Bauman. Dixie State tallied five more shots on goal in the second stanza, but Bauman managed to turn away each Trailblazer attempt to secure the win for her side. Murdock, who was named the PacWest player of the year, finished with a DSU single-season record 19 goals and 42 career goals over her four seasons in a DSU kit. Murdock also had three hat tricks this season and put her boot on three goals in the Trailblazers earlier 4-0 win over Notre Dame de Namur. 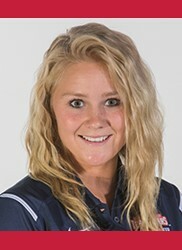 Murdock averaged 2.39 points per game, which ranks sixth in the nation, while her 19 goals ranks fourth. She also tallied eight game-winning goals, which is the third most in NCAA Division II. Montana Hadley joined Murdock on the All-Pac West first team and was named the PacWest defender of the year. Hadley led the defense that had a goals against average of 1.04. DSU shut out 39 percent of its opponents, producing seven shutouts. Hadley also helped the defense hold opponents to just 5.11 shots on frame. On the offensive end of the field Hadley dished six assists, which ranked her in the top 100 in the nation for all positions. The 12 Trailblazer wins this season are the most in Coach Bingham’s five-year tenure at DSU.